Introduction: Dysphagia in old patients secondary to diffuse idiopathic skeletal hyperostosis (DISH) syndrome is underdiagnosed. Surgical resection of the offending osteophytes is the definitive treatment. However, the timing of surgery in the course of the disease is still controversial. The study tries to find a correlation if any, between the timing of osteophytectomy surgery aimed to relieve DISH syndrome-induced dysphagia and the surgical outcome. Methods: During the period from 2010 to 2015, clinical and radiological data of patients who presented with dysphagia attributed to DISH syndrome were retrospectively reviewed along with their management and outcome. Results: One female and seven male patients were included in the study. Mean age was 71 years. Mean duration of dysphagia was 3 years and 10 months. Surgical resection was attempted through anterolateral cervical approach in five cases who were fit for surgery, in which four showed complete resolution of dysphagia (one experienced transient hoarseness of voice for 4 weeks postoperatively), and the fifth showed minimal improvement after limited resection due to intraoperative finding of marked esophageal adherence to osteophytes. The two unfavorable outcomes (subtotal resection and transient hoarseness of voice) occurred in relatively older patients (average: 75.5 years) with longer standing dysphagia (average: 7 years). Conclusion: DISH syndrome as a cause of dysphagia is commonly underlooked. Surgical resection of the offending osteophytes through an anterolateral approach is a safe and effective procedure. For patients who are fit for surgery, older age or longer duration of dysphagia might be associated with less favorable surgical outcome. Diffuse idiopathic skeletal hyperostosis (DISH), also known as Forestier's disease, is an enthesopathy of unconfirmed etiology, characterized by pathological osteoblast differentiation and ossification, leading to calcification of the anterolateral spinal ligaments, as well as the attachment sites of tendons and ligaments. Cervical bony outgrowths from anterior spinal ligament ossification are common, and most are asymptomatic. However, dysphagia secondary to compression of the esophagus by these osteophytes is unusual. In most patients with symptomatic cervical osteophytes, conservative management is sufficient. Only in cases with severe and progressive symptoms, surgical excision is considered appropriate. However, the timing of surgery in the course of the disease is still controversial. The aim of this study is to find a correlation if any, between the timing of osteophytectomy surgery aimed to relieve DISH syndrome-induced dysphagia and the surgical outcome. During the period from 2010 to 2015, clinical and radiological data of patients who presented with marked dysphagia attributed to DISH syndrome were retrospectively reviewed along with their management and outcome. All the patients suffered progressive dysphagia interfering with adequate feeding. Computed tomography images of the cervical spine confirmed the diagnosis of DISH syndrome according to the Resnick diagnostic criteria, i.e., flowing ossification within the anterior longitudinal ligament involving at least four contiguous vertebral bodies, associated with minimal degree of degenerative disc disease, in the absence of apophyseal or sacroiliac joints ankylosis or erosion. There were no symptoms and signs of cervical myelopathy or radiculopathy on clinical examination. Other probable causes of dysphagia, i.e., motility disorders, esophageal neoplasms, etc., have been excluded through a detailed otolaryngologic examination aided by ancillary tests, for example, barium swallow and upper esophagoscopy. All patients had tried at least 3 months of conservative management (e.g., swallowing training, with encouraging semisolid diet, and taking more time for eating), without satisfactory results. Data collected included gender, age, duration of dysphagia, preintervention weight loss, surgical fitness, surgical approach, and intra- or postoperative complications if any. Follow-up visits at 3 and 6 months postoperatively in the outpatient clinic were also reviewed, and patient evaluation of surgical outcome was assessed as satisfactory or unsatisfactory. Furthermore, weight gain restoration over the same period was recorded. Data were analyzed using the SPSS ver. 13.0 statistical software package (SPSS Inc., Chicago, IL, USA). The continuous variables are presented as mean ± standard deviation. A summary of all the data of patients reported in this study is depicted in [Table 1]. One female and seven male patients were included in the study. Mean age was 71 years. Mean duration of dysphagia was 3 years and 10 months. Preintervention weight loss was 7.3 ± 2.1 kg. Two cases were rendered unsuitable for surgery: an 86-year-old female patient with previous two thyroid surgeries and a 65-year-old male patient suffering from multiple comorbidities (diabetes mellitus, hypertension, previous coronary artery bypass graft surgery, morbid obesity, and chronic obstructive pulmonary disease) with high anesthesia risk. Another 72-year-old male patient chose to continue diet modification regimen despite its initial unsatisfactory results. In the remaining five patients, surgical resection was attempted through an anterolateral cervical approach, i.e., Smith-Robinson approach [Figure 1]. As the pathology usually affects >4 adjacent vertebrae (according to the DISH diagnostic criteria), and as per a gathered report from literature, the condition mainly affects the lower cervical vertebrae. A left-sided oblique incision along the medial sternocleidomastoid border was routinely used, as it provides a wider longitudinal approach with lower risk on the right recurrent laryngeal nerve at the lower vertebral levels. The enlarged osteophytes were cautiously exposed by contralateral displacement and protection of the tracheoesophageal midline structure. Any tough adhesions between any osteophyte and the dorsal surface of the esophagus should be left undisturbed, because the risk of esophageal tears and perforation is high. The osteophytes are then drilled using a rough diamond burr-down to the original anterior vertebral surface level, guided by intraoperative lateral fluoroscopic images. Fluoroscopic guidance is important as an incomplete excision of the osteophytes is usually misperceived as a completed job. Integrity of the intervertebral disc should be always maintained, especially when it usually shows mild degenerative changes, that it is preferred to keep a thin ossified shell on the anterior vertebral surface to avoid inadvertent drilling through the ventral disc annulus. A complete preoperative consultation for the consent should include clear message that osteophyte drilling aimed at improving dysphagia would not improve the reduced cervical spine mobility and limited neck range of movements that all DISH patients are typically suffering from. In one case, intraoperative finding of marked esophageal adherence to the bony osteophytes necessitated performing only limited osteophytectomy for fear of esophageal perforation. Another case experienced transient hoarseness of voice for about 4 weeks postoperatively, which eventually resolved spontaneously. These two perioperative incidences (subtotal resection and transient hoarseness of voice) occurred in relatively older patients (average: 75.5 years) with longer standing dysphagia (average: 7 years). In the follow-up visits, four operated patients reported “satisfactory” outcome with complete resolution of their preoperative dysphagia, with only the fifth patient (the one with limited resection secondary to esophageal adhesions) reporting unsatisfactory mild improvement [Figure 2]. Mean weight gain was 5.8 ± 2.5 kg at the patients' last revised visits 6 months postoperatively. DISH is a noninflammatory condition characterized by calcification and ossification of soft tissues, mainly ligaments and enthesis at their attachment points to the bone, especially in the region of the spine. Gradually, elongated osteophytes form at the anterior margin of the vertebrae and grow across the disc space. The etiology of DISH is unknown. Mechanical factors leading to ligament stretching, high water fluoride levels, vitamin A excess, and metabolic conditions producing increased insulin-like growth factor-1 have been hypothesized as potential causative factors. The process of slowly progressive DISH often causes no serious symptoms. Moreover, although DISH occurs much less frequently in the cervical spine than in the thoracic or lumbar spines, unlike “occult” DISH of these two spine regions, when cervical osteophytes grow to prominent sizes, it occasionally causes symptomatic dysphagia. As published in most case series, this condition occurs more frequently in men, typically in their seventh decade. These demographic data are similar to those noticed in this study. Moreover, due to the slowly progressive nature of the disease, there is usually a long latent period between the onset of mild dysphagia and the time of presentation to the clinics seeking help for malnutrition attributed to marked dysphagia. A mean duration of dysphagia of about 3 years and 10 months was calculated among the eight patients included in this study, highlighting the delayed presentation. In review of other similar studies, 57.5% of the cases presented after at least 1 year of initiation of their dysphagia. Differential diagnosis of dysphagia in this age group includes esophageal tumors, esophageal stricture, motility disorders, Plummer–Vincent syndrome, and other mediastinal mass lesions. Hence, a thorough oropharyngeal examination with the help of esophagoscopy and barium swallow is mandatory to exclude other causes of dysphagia, as conducted in all included patient in this study [Figure 3]. The patients often lose their weight due to difficulty in swallowing from pain or obstruction, leading to reduced food intake. Among the reported cases in literature, more than half of the patients (52%–71%) complained of weight loss, with almost one-tenth of them suffered significant (>10 kg) reduction in their body weight, within the period between the onset of dysphagia and the time of presentation. In this study, the preintervention weight loss was 7.3 ± 2.1 kg. It is difficult to precisely attribute the cause of DISH-induced dysphagia to a single pathogenesis as several possible etiologies have been proposed, i.e., simple external mechanical obstruction by the osteophytes, especially at a relatively fixed point of the esophagus, i.e., opposite the level of the cricoid cartilage (C6 level); also, inflammation of the periesophageal soft tissue in contact with the osteophytes may cause dysphagia, as well as reflex esophageal spasm caused by an irritating osteophyte. Most probably a combination of some or all of these conditions is responsible for dysphagia occurrence. Moreover, the more prolonged the periods of esophageal compression, inflammation, and irritation, the more chronic the local tissues alterations and adhesions would logically be. Usually, initially all cases, especially mild-to-moderate cases are treated with conservative methods, such as dietary modifications by changing their food habits toward softer diet, drinking plenty of water with food, taking more frequent meals with smaller quantity at a time, and taking enough time to complete the meal; also, a prescription of nonsteroidal anti-inflammatory drugs in the early stage usually helps. Surgical intervention to excise the offending anterior cervical osteophytes is usually reserved for patient suffering marked progressive dysphagia interfering with adequate nutrition. However, several surgical contraindicating factors should be considered; first, the disease mainly affects the elderly individuals commonly suffering other medical comorbidities; second, as mentioned earlier, the chronic esophageal irritation due to the prolonged course of the disease can induce local inflammatory adhesion; and third, these patients usually present in a state of relative or frank malnutrition posing higher risks to intraoperative tissue handling and postoperative wound healing. Therefore, the surgeon should be aware of the potential operative complications such as hematoma, Horner syndrome, recurrent nerve palsy, superior laryngeal nerve palsy, and esophageal injury or perforation, reportedly occurring at rates between 23% and 38%. In this study, two patients (25%) were considered unfit for surgery, one case denied surgery, and surgery was performed on the remaining five cases (62.5%). A close percentage (58%–71%) of surgically treated patients were reported in other similar studies. In all cases in this study, the anterolateral cervical approach was utilized being the most familiar and allows direct access to the targeted area and pathology. The same approach was also widely utilized in three-quarters of the operated cases in the relative literature, most probably for the same reasons. Two perioperative complications occurred as mentioned earlier, and both occurred in relatively older patients (average: 75.5 years) with longer standing dysphagia (average: 7 years). This can be attributed to the reasons discussed earlier, namely age-related morbidities, chronicity-related adhesions, and malnutrition status. All these reasons can be directly and indirectly correlated to increased patient age and/or prolonged dysphagia duration. In all the four operated cases where complete osteophytes excision was achievable, the reported reduction in dysphagia was satisfactory and weight gain was evident over the follow-up visits (5.8 ± 2.5 kg). The study has some limitations: it was retrospective, and the number of cases reviewed was small, mostly due to the rarity of the condition. DISH syndrome as a cause of dysphagia is commonly underlooked. Surgical resection of the offending osteophytes through an anterolateral approach is a safe and effective procedure. For patients who are fit for surgery, older age or longer duration of dysphagia might be associated with less favorable surgical outcome. Mader R. Clinical manifestations of diffuse idiopathic skeletal hyperostosis of the cervical spine. Semin Arthritis Rheum 2002;32:130-5. Krishnarasa B, Vivekanandarajah A, Ripoll L, Chang E, Wetz R. Diffuse idiopathic skeletal hyperostosis (DISH)-A rare etiology of dysphagia. Clin Med Insights Arthritis Musculoskelet Disord 2011;4:71-5. 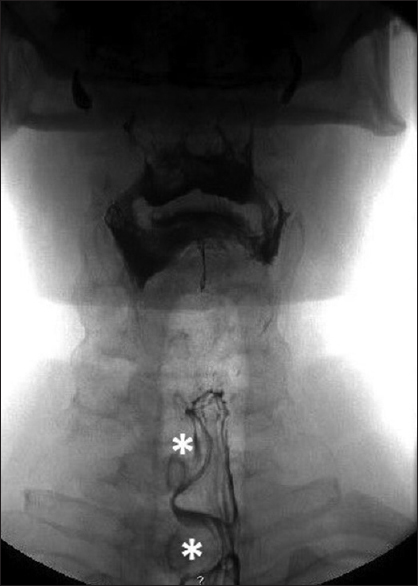 Srinivas P, George J. Cervical osteoarthropathy: An unusual cause of dysphagia. Age Ageing 1999;28:321-2. Sobol SM, Rigual NR. Anterolateral extrapharyngeal approach for cervical osteophyte-induced dysphagia. Literature review. Ann Otol Rhinol Laryngol 1984;93:498-504. Verlaan JJ, Boswijk PF, de Ru JA, Dhert WJ, Oner FC. Diffuse idiopathic skeletal hyperostosis of the cervical spine: An underestimated cause of dysphagia and airway obstruction. Spine J 2011;11:1058-67. Resnick D, Niwayama G. Radiographic and pathologic features of spinal involvement in diffuse idiopathic skeletal hyperostosis (DISH). Radiology 1976;119:559-68. Dutta S, Biswas KD, Mukherjee A, Basu A, Das S, Sen I, et al. Dysphagia due to forestier disease: Three cases and systematic literature review. Indian J Otolaryngol Head Neck Surg 2014;66:379-84. Chen YR, Sung K, Tharin S. Symptomatic anterior cervical osteophyte causing dysphagia: Case report, imaging, and review of the literature. Cureus 2016;8:e473. Yee C, Wong HY, Fewer HD, Rogers AG. Two cases of dysphagia due to cervical spine osteophytes successfully treated surgically. Can Med Assoc J 1985;132:810-2. Lecerf P, Malard O. How to diagnose and treat symptomatic anterior cervical osteophytes? Eur Ann Otorhinolaryngol Head Neck Dis 2010;127:111-6. Unlu Z, Orguc S, Eskiizmir G, Aslan A, Tasci S. The role of phonophoresis in dyshpagia due to cervical osteophytes. Int J Gen Med 2008;1:11-3. Veerabhadraiah P, Rao V, Shankar R, Shivappa N, Kumar P, Nagaraj T. Dysphagia caused by anterior cervical osteophyte: A rare entity revisited. Int J Head Neck Surg 2013;3:168-71. Rahimizadeh A, Taginedjadi O, Rahimizadeh S, Saghri M, Rahimizadeh A. Respiratory distress and dysphagia secondary to diffuse idiopathic skeletal hyperostosis: Case report and review. World Spinal Column J 2013;4:18-24. Ohki M. Dysphagia due to diffuse idiopathic skeletal hyperostosis. Case Rep Otolaryngol 2012;2012:123825. Ramadass T, Muthubabu K, Hegde SK. Giant cervical osteophytes their significance in ENT practice. Indian J Otolaryngol Head Neck Surg 1997;49:394-8. Clark E, Preston P, Wates A, Merry P. DISHphagia – A difficult problem to swallow. Rheumatology (Oxford) 2003;42:1422-3. 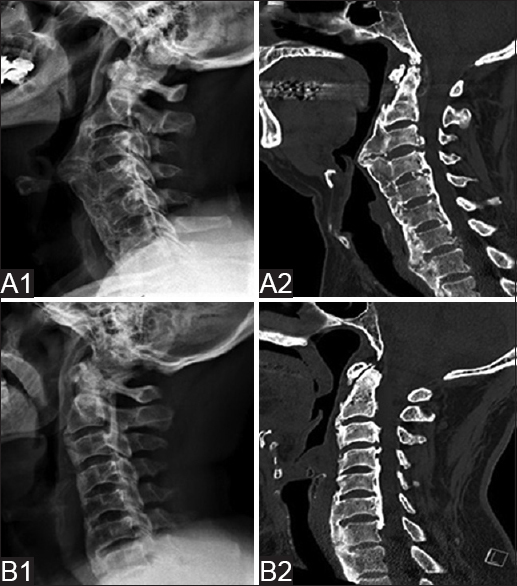 Solaroğlu I, Okutan O, Karakuş M, Saygili B, Beşkonakli E. Dysphagia due to diffuse idiopathic skeletal hyperostosis of the cervical spine. Turk Neurosurg 2008;18:409-11. Rai PV. DISH phagia! Saudi J Gastroenterol 2009;15:278. Albayrak I, Bağcacı S, Sallı A, Kucuksen S, Uğurlu H. A rare cause of dysphagia: Compression of the esophagus by an anterior cervical osteophyte due to ankylosing spondylitis. Korean J Intern Med 2013;28:614-8. Kaushik S, Karthikeyan A, Omer P, Singh R, Nath R. Diffuse idiopathic skeletal hyperostosis causing DYSPHAGIA – A rare presentation. Internet J Otorhinolaryngol 2011;12:7703.